As the debate over the post-2014 Afghanistan gains more attention, observers fear a ‘political earthquake’ in the country where the US troops’ withdrawal coincides with the next Afghan presidential elections. With the exit of the United States, Afghanistan’s economy and sources of financing the government in Kabul are likely to come under supreme challenges, they maintain. 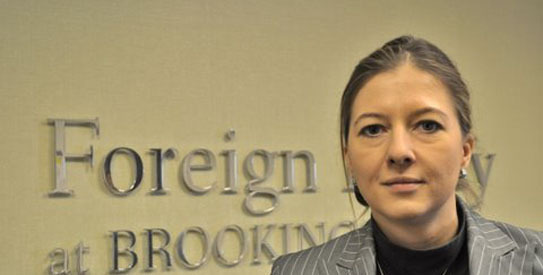 In an interview with Dawn.com, Vanda Felbab-Brown, a Foreign Policy Fellow at the Brookings Institution, Washington DC shares her thought on how prepared Afghanistan is for the transition. With a Ph.D. in political Science from Massachusetts Institute of Technology (MIT) and a B.A from Harvard University, Ms. Brown is an assistant professor at Georgetown University. She has extensively researched on Afghanistan, Pakistan, civil wars, terrorism, drugs and illicit economies. Her book Shoot Up analyses the relationship between insurgent groups and the drug trade in Colombia and Afghanistan. Q. Why has the American leverage over Afghanistan decreased in the past decade? A. The security situation in Afghanistan has deteriorated. Many parts of the country still remain hard to manage. The level of public optimism is much weaker today. The US announcement to pull out most of the troops by 2014 has left the people wondering as to what extent the Taliban would be undermined before the withdrawal. Washington has also lost leverage over President Hamid Karzai. The relationship with Karzai has not been totally unproblematic but now he is hedging on all sides. Q. Can the Afghan National Army and the Afghan National Police manage the post-2014 situation? A. The story on the Afghan National Army (ANA) is more positive than the Afghan National Police (ANP). The ANA has received extensive training; increased the number of personnel and partnered with the International Security Assistance Force (ISAF). The question now is how capable it will be to stand against Taliban , the Haqqani Network in the East and other rogue militias. This year, in some areas, the ANA will be required to fight mainly on its own with little ISAF support. The ANA is confronted with ethnic imbalance because the commanders from the north dominate it while a very small number of Pashtuns joined the force. We do not know if the army will come under pressure to breakup ethnically after 2014 if violence escalates and signs of civil war arise. The Afghan National Police (ANP) is sort of the bigger problem because it is confronted with ethnic issues and a lack of accountability. The people view ANP as abusive, corrupt and often complicit in crimes. Besides these two forces, the Afghan Local Police (ALP) was raised from the local population in areas where the ANA and ANP presence is very weak. They are extremely susceptible to far greater abuse of power. Q. Islamabad complains about the Tehreek-e-Taliban Pakistan (TTP) having strongholds in eastern Afghanistan while Washington and Kabul grumble about the Haqqani Network using Pakistani territory as a safe haven. Why does such ‘unfaithfulness’ exists between the key allies in the war on terror? A. Historically, the porous Af-Pak border, which is extraordinarily difficult to seal, has been a part of the problem. There is a big difference between the Pakistani complaints and the US grievances. Pakistan complains that the TTP uses Eastern Afghanistan for safe havens. If the US receives intelligence reports, they are far more motivated to go to take action against these groups. On the other hand, the US believes Pakistan has not shown any motivation to tackle the Haqqani Network but instead systematically allowed it to flourish. This is despite of the fact that it is the deadliest of all the networks which is also responsible for the attack on the US embassy. From the US perspective, there is not a bigger irritant than Islamabad’s continued tolerance of the Haqqani Network. Q. Isn’t it ironic that the Afghans complain about Pakistan’s influence over their country but they also refuse to recognise the Durand Line as an international border so that both the countries fence parts of the border to avoid infiltration from both the sides. A. Although Pakistan had suggested fencing some parts of the border, the offer has extremely annoyed President Karzai because he does not recognise the Durand Line. Plus, Pakistan is not popular in Afghanistan for historical reasons and because the Afghans view Pakistan as a country that is currently supporting Taliban and the Haqqanis. Karzai is vulnerable to domestic pressure which makes it hard for him to concede to the Pakistani proposal. Q. How potential are Afghanistan‘s internal ethnic conflicts? A. Besides the issue of religious extremism, ethnic unrest has historically remained a major challenge for Afghanistan. The Hazaras have been the most oppressed. The Tajiks are the second most important group followed by the Uzbeks. In each group there are sub-clans. For instance, the Pashtuns are sub-divided among the Durranis and the Ghilazais. The Durranis from Kandahar city have ruled Afghanistan for centuries and suppressed the Ghilzai Pashtuns without giving them access to power at local or national level. Much of the Pashtun movement in 1990s drew support from the Ghilzai Pashtuns and appealed the groups that had been underprivileged. The Pashtun complexity is overlapped by the relationship between the Tajiks and the Durrani Pashtuns. The Tajiks have historically perceived themselves as oppressed who had no access to power in Kabul until 2001 when the government headed by a Durrani Pashtun, President Karzai, was dominated by northern Tajik commanders was formed. That balance of power changed in mid-2000s when more Pashtuns came into the government. Thus, the possibility of negotiations with the Taliban stirred ethnic tensions and raised questions as to who will gain power after 2014. Tensions will also rise about the number of commanders in the ANA and ANP as most of the commanders are non-Pashtuns from the north. Q. Is there a post-2014 strategy on the cards to ensure uninterrupted funding for ANA, ANP, ALP? A. This is part of the process of transition. Clearly, the bill for Afghan national security forces cannot be paid by the Afghan government. A transition strategy needs to be developed as how to generate revenue for Afghanistan so that it can pay for its security. It’s a long-term process. No matter how many troops the United States pulls out in 2014, no one is actually hopeful that the Afghan government will be capable of paying for its security afterwards. It is very much expected of the United States and the international community to continue to pay for Afghanistan’s national security. We do not know how much budget they will commit. Q. Does Washington still view Karzai as ‘indispensable’ for Afghanistan? A. That is one of the big questions surrounding Afghanistan. President Karzai had said that he does not intend to run for a third term. Also, the Afghan constitution bars a candidate from becoming the president for more than two terms. Karzai may change his mind as elections near. If he decides not to run then the field will be open for different candidates like Dr. Abdullah Abdullah, Amrullah Saleh, Ashraf Ghani and others. But we do not know who the future candidates would be until Karzai makes a final decision. Q. What are the prime concerns for 2014 presidential elections? A. We need to worry how high ethnic tensions will get during the elections and to what extent the security forces will be capable of preventing the Taliban from spreading violence during the election process. We also have to wait and see how much consensus will be developed among the candidates about the future president? Q. What trend do the killings of Ahmed Wali Karzai and Burhanuddin Rabbani indicate? A. Both these killings illustrate the vulnerability of the Afghan elite and power-brokers. The motivation behind the killing of Ahmed Wali Karzai is still unclear. Majority of Afghans do not believe that the Taliban were behind his killing. On the other hand, in Rabbani’s case, it is clear that the Taliban ordered the killing but what remains inconclusive is whether it was the Haqqani Network or the Quetta Shura that killed him. Another question the Afghans are asking is whether Pakistan and the ISI authorised and directed that killing. Wali’s killing has significantly undermined President Karzai’s support base in Kandahar and raised concerns about his safety. One lesson Karzai learned from these killings is that negotiations with Taliban will not go as easy as he had thought earlier. Q. Why is it so difficult to keep Afghanistan’s neighbors away from interfering in its domestic affairs? A. Outside forces have had a very detrimental effect on Afghanistan. One important source of outside influence is Pakistan which is paranoid about the possibility of being encircled by an India-friendly government in Afghanistan. The recent signing of the strategic agreement between Kabul and New Delhi surely did not assuage Pakistan’s fears. Pakistan has always tried to cultivate actors to gain influence over Kabul. Pakistan has almost always done this with the exclusion of the northern groups and with the support of the Pashtuns. It is ironic because Pakistan’s own Pashtun population has historically received harsh treatment or neglect. Many Pashtuns, at the same time, strongly resent Pakistan’s cultivation of proxies inside Afghanistan because they view this as interference into Afghanistan’s affairs. India has tried to cultivate its proxies and supported non-Pashtun groups. During the civil war of 1990s, Iran supported the Hazaras for ethnic and religious reasons. Ironically, Russia was supporting the Northern Alliance although they had fought against the Soviets during the Cold War. Today, we are seeing efforts to re-cultivate those proxies because we don’t know at this point if post-2014 Afghanistan will be stable. Q. Who do you think is the right authority to address Pakistan‘s concerns in Afghanistan? A. It would be easier to do so if we had only one actor in the region. For Pakistan, the relations with US means to get an assurance that India will negotiate over Kashmir while for India it is primarily linked to getting Pakistan ceasing cooperation with Islamic groups inside Kashmir. Thus, the problem will not be solved only through Pak-Afghan engagement. Kabul wants to cultivate India as a proxy in case its relationship with Pakistan worsens. The signing of the recent strategic agreement was precisely a move in frustration because of the Rabbani killing and the attack on the US embassy. There was a time when India and Pakistan had nearly reached an agreement on Kashmir during Musharraf’s term but the Indian government was not capable of delivering. Later on, Musharraf lost his influence in Pakistan but it showed that India and Pakistan were both capable of resolving their problems without the major involvement of the United States or China. There is much of a possibility for both the countries to move forward if they liberate themselves from the constrains of history. If India-Pakistan issues are not resolved, Pakistan will continue to frustrate the US in Afghanistan by not taking action against the Haqqani Network which will further poison the relationship because US troops are getting killed as a result of the ISI-Haqqani nexus. If some more American soldiers are killed in Afghanistan with the support of Pakistan, the fallout would be huge. The US Congress has become extremely anti-Pakistan because it views Pakistan as complicit in terrorism against the United States. Q. What do you think will happen if security situation worsens in Af-Pak after 2014?